Someone just found an amazing home! Well two people did. Actually it was more like two sets of people found an amazing home each. And we loved walking with them every step of the way. There is something special about helping families find homes. A home is one of the biggest financial and even emotional invesments of life, so we take our role seriously. The first home we sold was one we had listed. 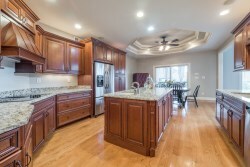 18741 Willington Cir is a beautiful 5 bedroom, 4.5 bathroom, 5000 Sq Ft home. This home was amazing for entertaining with a beautiful great room that flowed effortlessly into a formal dining room and open eat-in kitchen. The kitchen opened out onto a delightful covered porch which will be perfect to relax on for this time of the year. 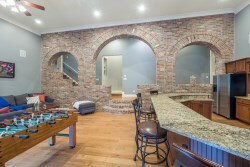 The fully finished basement in this home is incredible. It has a 12 seater bar sided by a lounge which lead out onto a backyard entertainment space replete with built in gas grill and wood burning fire area. The basment also included a multi-level seating indoor theater and space for a pool or ping pong table. No doubt this will be well used by the new owners. Our second home was not one we listed, but one we found for our clients. 496 Jennymac Dr was listed by Nick Groft of Smith Realty Group. 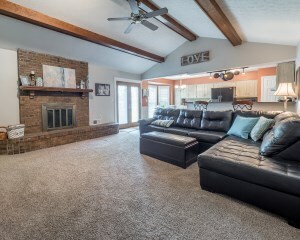 This was a great Ranch style home with an open floor plan and a vaulted cieling in the great room. This home has 3 bedroom and 2 bathrooms, the master having an ensuite bath. If you are wondering about selling your home or stuggling to find a new home we would love to help you. We have 30 years of combined real estate experience. We know real estate Louisville. Contact Scott Boehnlein or any of our other agents at Family Realty. I'm rushing. It's Friday. 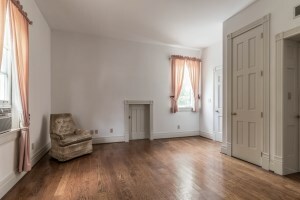 Just found out I'm photographing a home. In 15 minutes. It's 15 minutes away. I'm on my way. I'm in my head, rearranging the day's schedule. It's going to be hectic. I'm close now. I've arrived. I look up. Serenity. I'm standing on the corner of a large green lawn. A tall great tree extends its leafy bows in shady protection of its yard. A gentle breeze blows in from the South East and rustles the leaves of this tree guardian. 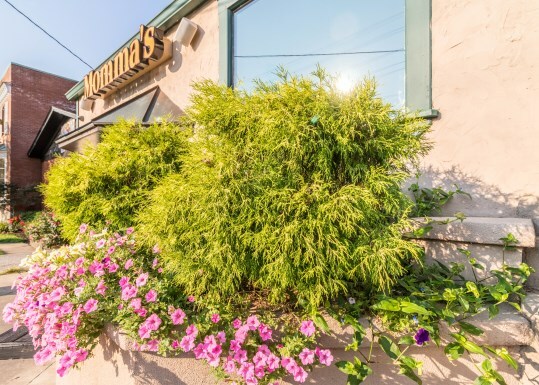 Carefully manicured bushes, shrubs, and flowers surround inviting outdoor seating areas. I want to sit down, start a fire, put my feet up, and sip a cup of coffee. But I can't. I have to photograph the home in this yard. But it's going to be a pleasure. 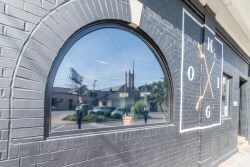 That was my experience photographing 4003 Elmwood Ave. 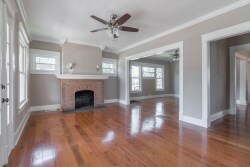 This 2 bedroom, 2 bathroom home has all the charm you would expect from a house in St Matthews. 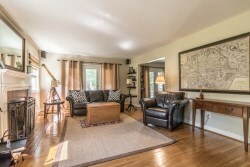 This updated ranch style home draws in lots of natural light complementing the hardwood floors. The front great room has a wood burning fire place and, although welcoming, allows access to all other areas of the house. One could go through the large double doors to the side yard sitting area. Or down the hall to the bedrooms. Or into the formal dining area. 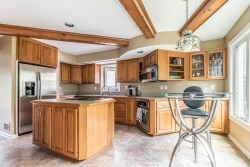 The formal dining area sits side by side the kitchen, seperated only by a bar style kitchen counter. 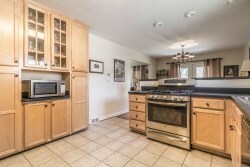 The kitchen has stainless steal appliances, tall cabinets with ample storage. This whole area also opens out to the same side yard sitting area. There are two bedrooms. 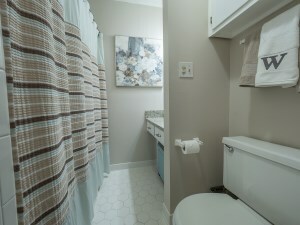 The second bedroom also has lots of natural light and is served well by a full bathroom one door over. 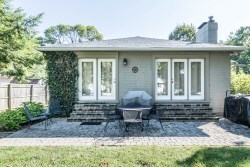 The master suite has a full ensuite bathroom, a large walk-in closet, and opens onto another side yard sitting area through large double doors. 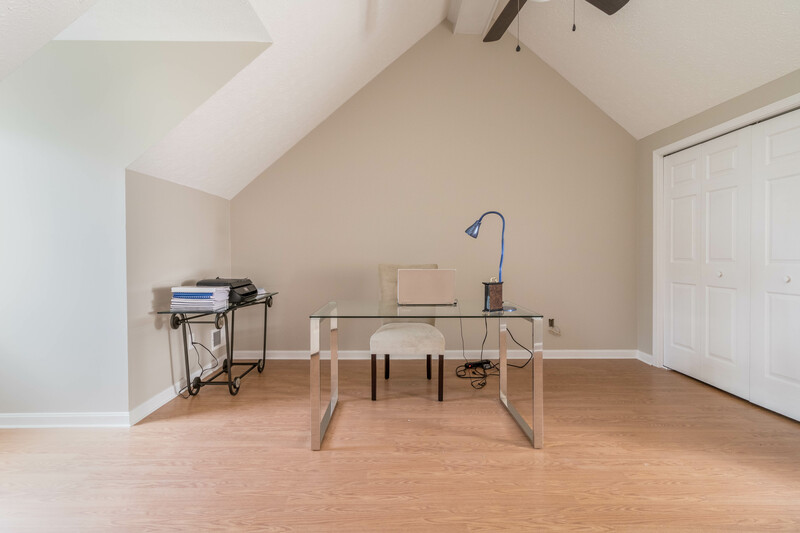 The finished basement could serve as another great room, bedroom, or large office. There is also a seperate section of the basement that provides lots of storage. 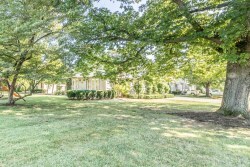 This home has a large flat yard, front porch, and perfectly manicured landscaping. If you would like to experience this tranquil home as I did and possibly make it your home please contact Scott Boehnlein of Family Realty. "Country road, near the city, take me home..." Okay so I changed the words a little. 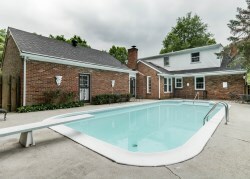 But it describes the home that we have recently listed in real estate Louisville. 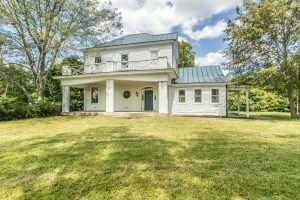 This home which is relatively near the amenities of urban life still has all the charm of country living you could want. It really is the best of both worlds. 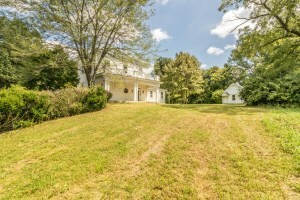 11201 Easum Rd is a multi-level 2053 Sq Ft, 2 bed, 2.5 bath home which sits on 5.5 acres of land. That is right, 5.5 acres of land to do with what you please. The property also features a 4-car garage, an additional building with a 1-car garage, and an attached 1-car carport. This home has tons of charm and character. 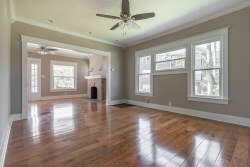 Hardwood floors extend throughout the home. 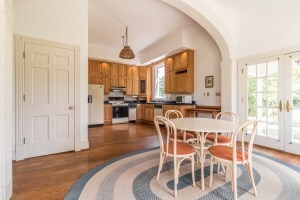 Extensive crown moldings, trim and woodwork, large inviting windows, tall ceilings, and beautiful archways all contribute to the charm of this home. 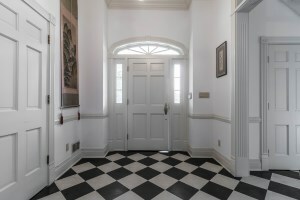 The first level contains a large grand room with formal dining room, a large kitchen with eat in breakfast nook, which leads out onto a covered side porch. A half bath and laundry room completes this level. 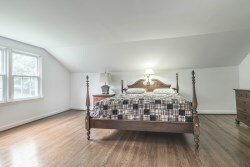 Moving upstairs you will find two bedrooms and two bathrooms. The master bedroom includes an ensuite. The second bedroom also has an ensuite bathroom which can also be accessed from the hallway. We would love to help you make this house your home. Please contact Scott Boehnlein of Family Realty for more information or to arrange a viewing of this lovely property. The world is buzzing with talk of the Solar Ecliplse. Indeed this is a very unique moment in history. The moon will pass perfectly between the Sun and Earth so as to block the Sun's light from large portions of the globe for several minutes. This is such a unique event that NASA is reportadly "sponsoring 11 ground-based science investigations across the United States". Even as I write this blog right now I can see the world growing dark as moon shadow creeps over the land. But although the moon is eclipsing the Sun, nothing will eclipse the fact that we sold yet another house this weekend. 2914 Summerfield Dr was listed 10 days ago by Scott Boehnlein and is now under contract. 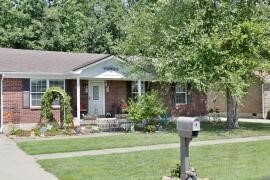 This 3 bedroom 3 bath home in the Hikes Point/Jeffersontown area was a great buy. 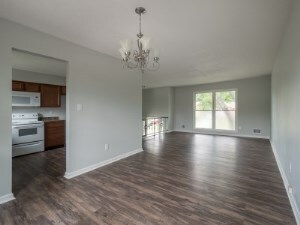 There were many updates to this home including inclucing fresh paint, new windows, new light fixtures, updated bathrooms, new professional landscaping, and new flooring throughout most rooms. No wonder it sold so quickly. 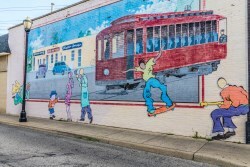 Jeffersontown is a well known and well loved area of Louisville, with great homes, neighborhoods, shopping, as well as the largest industrial park in the Commonwealth. Many love to call Jeffersontown home. You could too. We would love to help you find a home or sell your home in Jeffersontown, or anywhere in Louisville. Please contact us at Family Realty for any information you might need about real estate Louisville. With the end of the Summer school holiday season we had a flurry of out of town visitors come visit us in Louisville. I recently wrote of friends coming from Florida, but since then my sister came to visit from trip she is enjoying in Mexico which she is using to learn Spanish. Naturally I wanted to show off Louisville's eclectic foody scene, however my sister is a chef for a living, and a really good one. So I wanted to take her somewhere unique. We were feeling like meat, burger meat specifically, so we ended up at one of the most unique burger places in Louisville. If not in all of the continental United States, Game. Game, as the name suggests, serves burgers of exotic wild game which they source from local farmers. Some of your burger choices include bison, lamb, wagyu, duck, wild boar, and elk. So we took a dive into the deep end ordering things we'd never eaten before and and were very pleased to recieve thick, juicy, perfectly cooked and sided burgers. 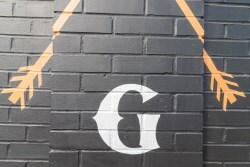 But Game is one of only three of the owners restaurants. One of their other eating establishments is Migo, which serves quite different fair. 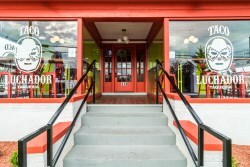 Migo is a "corner door eatery" which serves great latin style food, while making sure to stay creative and also serve some of their own unique meals. 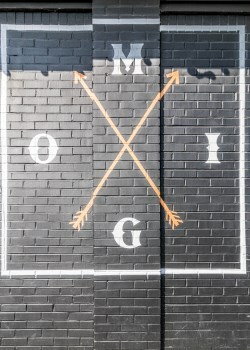 I haven't yet eaten at Migo, but have recently discovered that it is only minutes from my office. So I'll probably need to make a lunch trip over there sometime in the near future. Migo, like my office, is located in the lovely highlands area. Having recently blogged about the Highlands there is not need to go into much detail of how great an area it is with it's great local restaurants, unique store fronts, great neighborhoods, and lively culture. We have a home for sale in the Highlands just down the road from Migo. 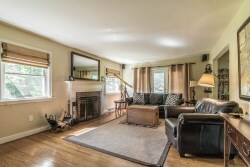 2241 Dundee Rd is a completely renovated home. This lovely open plan home has wood flooring throughout the first floor. 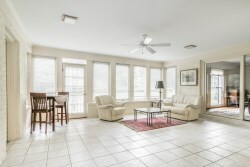 The front room, formal lounge, sun room, and kitchen flow effortlessly from one to the other. 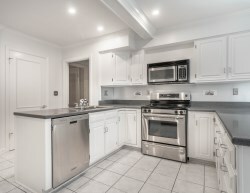 The kitchen is fully updated with new stainless steal appliances. The second level includes two large bedrooms and a large master suite. The upper level is fully carpeted. There is a full bathroom and a full ensuite bathroom on this level. 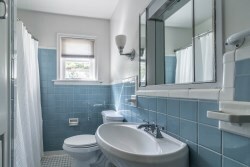 A half bath is included on the first level. If you are interested in this home please contact Chris Dayton of Family Realty. Or if you want any further information about real estate Louisville any one of our dedicated agents at Family Realty would love to help. Maybe we could even meet at Migo for lunch. We love listing homes we know people are going to love. It is so great for us to list two new homes this weekend for real estate Louisville, plus have Open Houses set up for both of them. We have already had the pleasure of introducing you to the first of the two, now I have the pleasure of introducing to the second of the two. 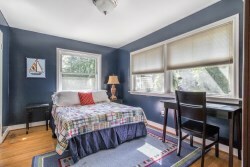 4003 Elmwood Ave is an Oasis of a home in the exceptionally sought after St Matthews area. Tall green trees and manicured front lawns line the streets as you drive toward this 2 bedroom 2 bathroom home. A large front yard greets you as you pull up to this home. A great tall tree stands guard in the front yard, while well kept plants, bushes and other foliage outline side and back yard sitting areas. Walking in the front door you are welcomed into the great room complete with fire place, large windows, and glass paned doors leading to the side yard. From the great room you can see the formal dining room which opens to the kitchen complete with stainless steal appliances. From the kitchen you can get to the basement, half of which is finished, the other half offering great storage. The ground floor has two bedrooms and two full bathrooms. 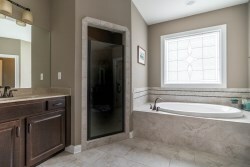 Included in these is the master suite with ensuite bathroom. 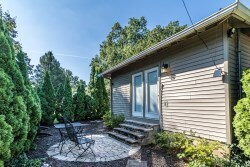 The master has a large walk-in closet, and also leads out onto another side yard seating area, perfect for relaxing after a long day at the office. We are hosting an Open House this Sunday from 2pm-4pm for this home. If you would like more info or would like to see this home before then please contact Scott Boehnlein at Family Realty. It's Friday and the weekend is upon us! I'm usually looking forward to the weekend anyway, but it's even better to hit the weekend with great news. We have great news for those with their eye on real estate Louisville. We have just listed two new houses and will host Open Houses for both of them this Sunday from 2pm-4pm. 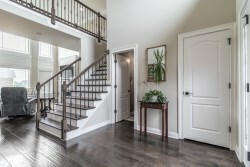 15425 Timmons Way is the first of these great homes. This home is a large, multi-story, 4 bedroom, 3.5 bathroom, fully upgraded, 3 year old home. Walking in the front door you are greeted with lots of natural light pouring in through the large windows, as well as all wood floors. From the front door you can see the formal dining and great room which leads into the kitchen and kitchen nook. 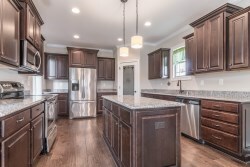 The large kitchen has granite counter tops, stainless steel appliances, an island, and a large pantry. The great room has a fireplace and floor to ceiling windows. 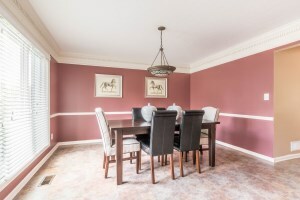 The formal dining room features wainscoting and a tray ceiling. The large master suite with ensuite bathroom and a laundry and mud room completes the first floor. The master includes a sitting area and a large walk-in closet. 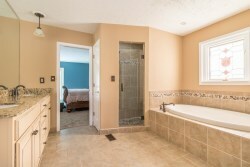 The ensuite bathroom features his/her vanities, a whirlpool tub, a ceramic tiled shower and floor, and a bath. 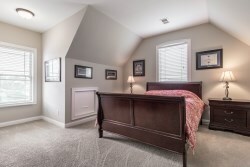 The second floor has 3 bedrooms all including walk-in closets. One has an attached full bath. There is also another full bath, a huge walk-in closet in the hallway, and an open hallway that overlooks the great room. This makes the second level feel part of the whole home and creates a wonderful open living experience. 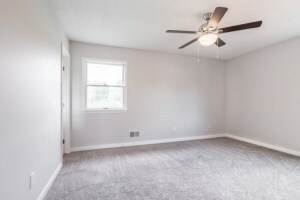 The basement has 9 ft ceilings and although it is unfinished it has been framed out for a large open great room, a full bath, a separate room with a closet, and storage areas. This basement has fantastic potential to be a wonderfully comfortable living area and has plenty windows letting in natural light. If you are interested in this property or want more information please contact Scott Boehnlein of Family Realty. There will be an Open House at this property this Sunday from 2pm-4pm. We hope to see you there. Part two of this blog will be coming shortly. A great new home has just been listed here at Family Realty. 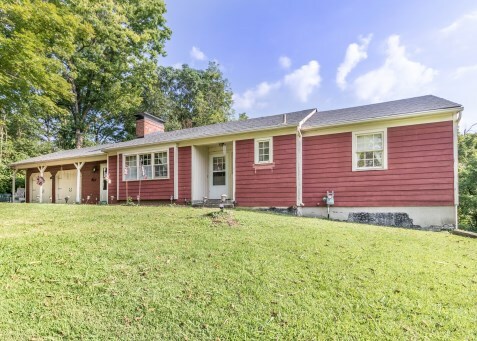 2914 Summerfield Dr is a 3 bedroom, 3 bathroom, ranch style home in great Jefferson County. 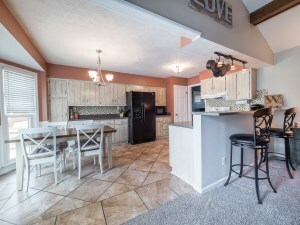 This $225,000 home has several great updates that really make it a great family home. Updates incluce fresh paint, new windows, new light fixtures, updated bathrooms, new professional landscaping, and new flooring throughout most rooms. A great updated feature of this home is the eat-in kitchen which has new counter tops, backsplash, breakfast bar, pantry. 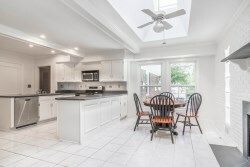 This kitchen is great to gather the family together and opens directly into the family room. The family room has vaulted ceiling, wood beams, a fireplace, and new french doors leading to the large backyard. Everyone needs a great master bedroom and this house has just that. 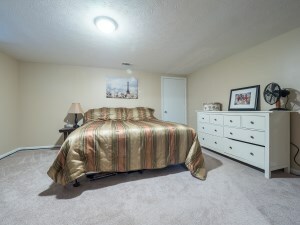 The master bedroom features his/her closets, an attached and updated full bath with new granite counter tops, sink, faucet, paint, fixtures, and mirror. We weren't joking about the many updates. 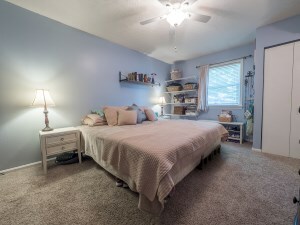 The main level has two additional bedrooms, another updated full bath, and a laundry room conveniently located off the 2-car attached garage. 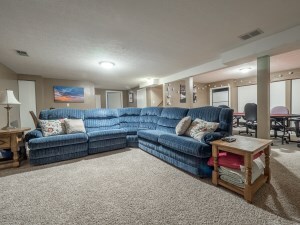 The basement is another great feature of this home. 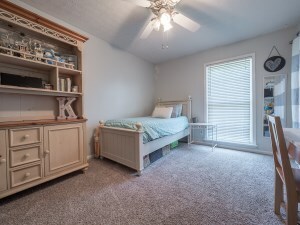 The basement is fully finished and includes a large great room, a possible 4th bedroom (it has small window but no egress window), an updated full bath, a craft room, a playroom, and two storage rooms. 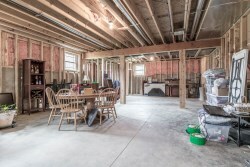 This is the perfect basement for the family as we look forward to fall and winter. 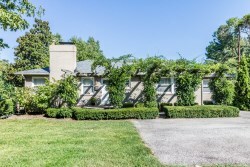 This home has lots to offer for real estate Louisville. Please contact Scott Boehnlein at Family Realty if you are intersted to view the home or need any further information. We would love to help you find your new home. 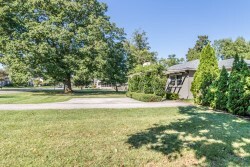 1901 Daleview Ln is situated in the historic and highly sought after Springfield subdivision. Springfield is the location of the historic home of Zachary Taylor, 12th president of the United States. Tall trees and manicured gardens line the streets of wonderful homes. 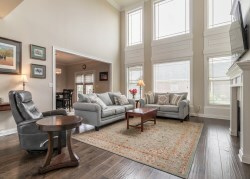 1901 Daleview Ln is a 4 bedroom 3 bath room 2 level home with an inviting front porch. 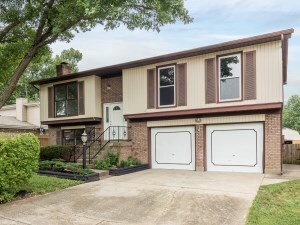 There are many updates thoughout this home including new roof, new windows, and new heater. 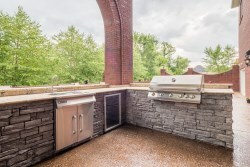 The beautiful kitchen is also updated with stainless steal appliances and features a unique skylight and fire place rare in real estate Louisville. 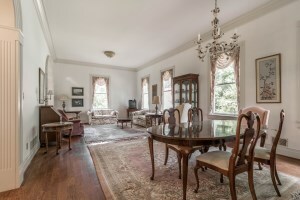 The first floor also contains two large living rooms, a formal dining room, a Florida room, bedroom, and full bathroom. Moving upstairs you will find three more bedrooms, including a large master suite with ensuite bathroom and walk in closet. Another full bath completes the upper level. Moving into the basement there is a family room, built-in bookcase, a bar, a storm shelter, and lots of storage. The backyard has a great pool area with an in ground pool. There will be an Open House this Sunday from 2pm-4pm for this property. If you need more info or would like to see the home before everyone on Sunday please contact Scott Boehnlein at Family Realty. Everyone wants to live in a great neighborhood. It is not only a good financial investment in real estate Louisville, but also an investment into your family. Safe streets to play on, super ameninities for Summers or after school afternoon fun, and neighbors that become almost family. The Lake Forest subdivision has been just that neighborhood in Louisville for many years. 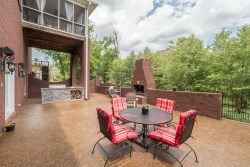 705 Lake Forest Pkwy is a fantastic home in this awesome neighborhood. Walking into this home you are greeted with an immediate sense on the space and elegance this home offers. 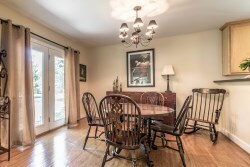 To your left is a formal dining room leading into the kitchen. On your right is a formal lounge leading onto the large living room. 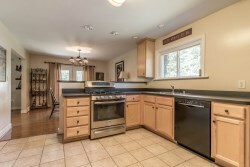 The spacious kitchen with stainless steel appliances features a window eat-in kitchen nook. The kitchen opens out onto the afformentioned living room. 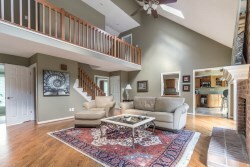 This living room has a balcony overlooking the backyard and vaulted ceilings giving view to the second floor. But before we move up stairs the first floor is completed by a large master suite, with an updated ensuite bathroom featuring a double vanity, bath, and shower. 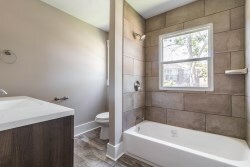 The first floor also includes a half bath. The second level overlooks the large living room and contains three bedrooms and a full bathroom. 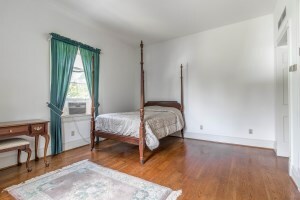 The third bedroom could double as an office. 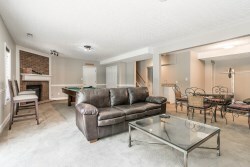 Moving back downstairs you will notice stairs leading further down into the fully furnished large basement. This basement has room for a lounge, dining/work out area, pool table, and includes a full bath and walkout onto the backyard. 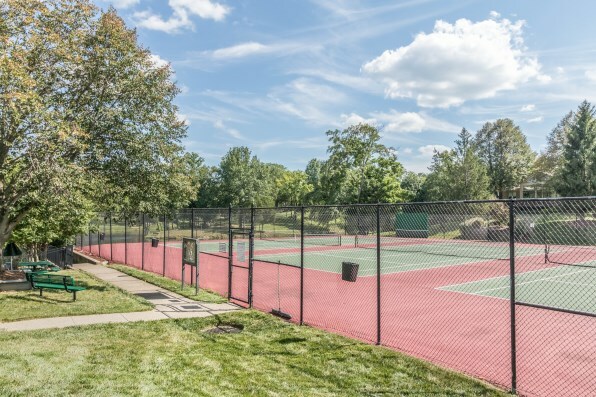 But if that is not enough the Lake Forest subdivision has incredible amenities inculding a lodge, several pools, volley ball and tennis courts, a playground, and a lake. We are hosting an Open House for this property on Sunday from 2pm-4pm. But if you need more information or would like to see the home before then please contact Christopher Boehnlein at Family Realty. Are you ready for a move in ready home? Who needs a fixer upper when we have a recently renovated gem? 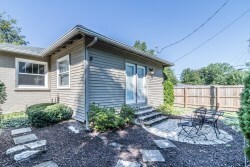 7804 Canonero Way has been completely remodeled and is conveniently located near Bardstown Rd and Hurstebourne Pkwy. Both popular roads for real estate Louisville. 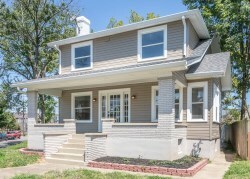 This 3 bedroom, 2.5 bathroom home has more than just a fresh coat of paint. 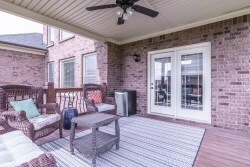 The open living, dining, and kitchen area have new flooring (well so does the whole house) This great area to host friends and family leads out onto a balcony overlooking the backyard. If you are interested in this home or just need more information please contact Christopher Boehnlein at Family Realty. "Isn't Louisville known for their BBQ?" a friend asked last weekend as we were deciding where to get dinner. They were visiting us from Florida, so naturally we wanted to take them to one of Louisville's great restaurants. Once they said BBQ we knew exactly where we were going, Momma's Mustard, Pickles and BBQ. Even though it was a Sunday evening they were fill and sat us in their second level seating area. We received our drinks, started to peruse the menu and were immediately in a BBQ conundrum...everything sounds amazing how do we choose? Our server came to the rescue with some helpful insights. He pointed out the wings were featured on "Diners, Drive-Ins and Dives", they use a Kansas dry rub with BBQ sauce on the side (not actually needed as the dry rub is so delicious), and that 1% of our order will be matched by Momma's and the 2% would be donated to local charities. Armed with the afformentioned insights I ordered the pulled pork sandwich, three of our crew ordered the wings, one of the guys ordered the burnt ends, and one of the ladies ordered the slider sampler! In no time at all our plates arrived brimming with meat, mac 'n cheese, french fries, and green beans. The conversation paused and a silence took over our table as our taste buds were delighted by some of the best BBQ we have ever tasted. As we shared our enthusiatic endorsment of what we ordered, one of the ladies said, "I know why those wings were on Diners, Drive-Ins and Dives." So you're hungry right now, no doubt. 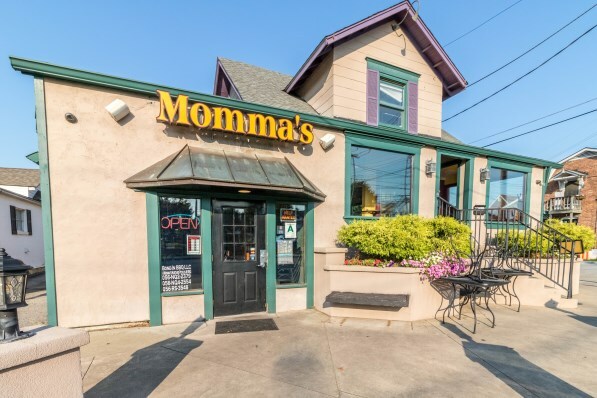 Head over to Momma's Mustard, Pickles, and BBQ. They have two locations, one in St Matthews, the other on Hursteborne Pkwy. 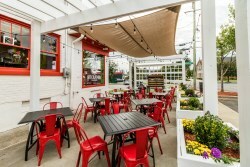 We dined at their St Matthews location (102 Bauer Ave). St Matthews is an ideal Louisville neighborhood. It features many authentic restaurants, great shopping, and super parks. The Mall St Matthews is probably the first mall that comes to mind when thinking of Louisville shopping, but St Matthews also features a second great mall, Oxmoor Center. Homes in St Matthews are of diverse architectural styles. They range from charming Cape Cod style homes to Craftsman Bungalows, Tudors and mid-century ranches. If you are interested in moving into St Matthews we would love to help you find a home in this great area. Please contact Scott Boehnlein or any of our agents at Family Realty. 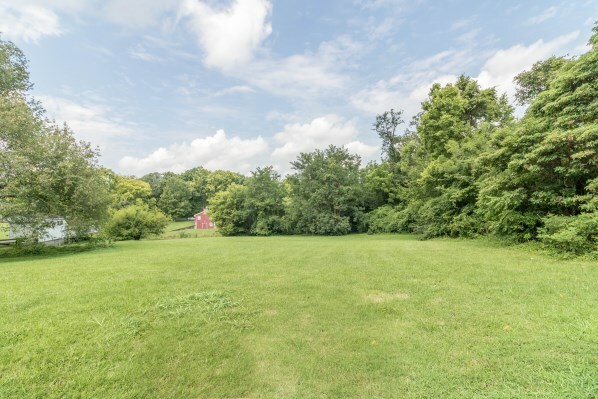 If you are looking for a large amount of property on Bardstown Rd we have just the right place for you, 5235 Bardstown Rd. 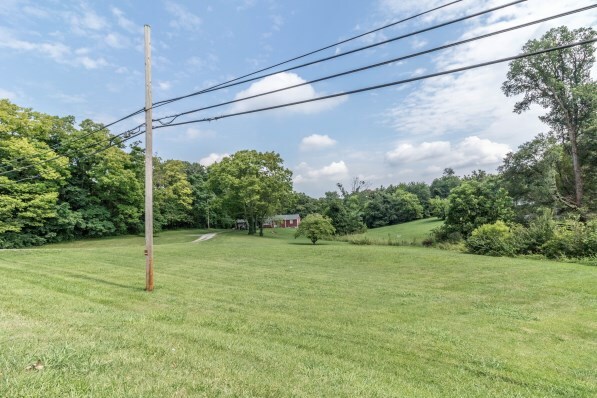 This amazing lot is 4.26 acres, includes a cute ranch style home and is located just before Hurstbourne Pkwy. This home has 2 bedrooms and 1.5 bathrooms. 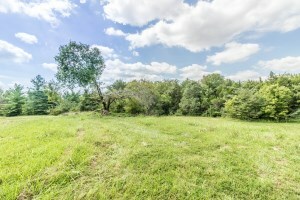 The real draw of this property is the size of the lot, which could be perfect for commercial use even though it is currently zoned for residential. 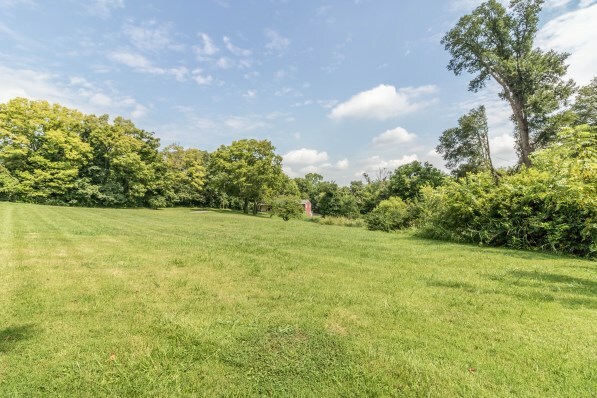 Real estate louisville rarely gets such a large lot in such a great location. If you need further information please contact Scott Boehnlein of Family Realty. Does a freshly and fully remodeled home catch your attention? Have you had your eye on real estate Louisville for just such a home? If so we have the home for you. 7804 Canonero Way has recently be totally renovated. 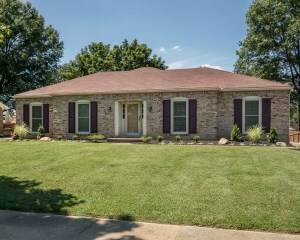 This multi-level home with great sized back yard is located just off Hurstbourne Pkwy and Bardstown Rd. This 1,670 square foot home has 3 bedrooms and 2.5 bathrooms. The upper level features an open kitchen and living space, master suite with ensuite bathroom, two other bedrooms, and another full bathroom. The basement is fully finished, includes a half bath, and a walk out onto the backyard. 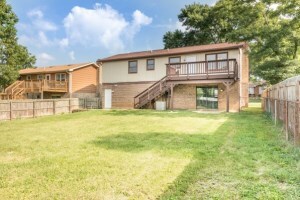 The back yard is a great size for lots of fun activities, and can also be accessed from the kitchen on the upper level. If you are interested in this property please contact Scott Boehnlein at Family Realty. One of Louisville's most prestigious communities is Lake Forest. Entering Lake Forest is almost like entering a secret garden. Wide roads are framed with beautiful landscaping and exquisite homes. 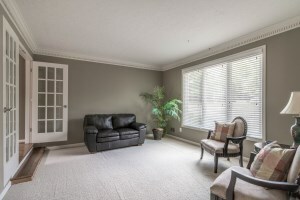 As I am sure you have guest 705 Lake Forest Pkwy is nestled in this wonderful community. This 4 bedroom 3.5 bath multi level home is a must see for all interested in real estate Louisville. 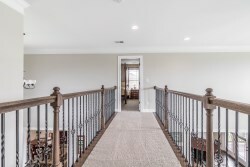 The mostly open plan first floor features a large grand room with fire place, kitchen, formal dining room, formal lounge, a half bath, master suit with ensuit bathroom, and a walk out onto a deck. The kitchen has stainless appliances. 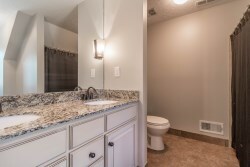 The large master bathroom includes a double vanity, bath, shower, and two walk in closets. The second level overlooks the first floor with a balcony and includes three bedrooms and a full bath. One of the bedrooms could also be used as an office for comfortably working at home. 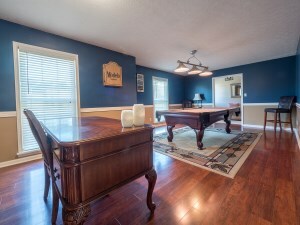 The fully finished basement has enough room for a pool table, lounge, and a bed. 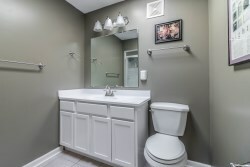 The full bath in the basement is recently updated and very comfortable. The basement leads onto a back patio and the back yard. 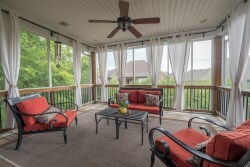 This space plus the first level deck makes this home perfect for entertaining family and friends. Another great feature of this home is all the amenities that the Lake Forest community has to offer. 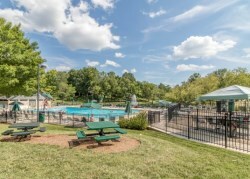 There is a lodge, several swimming pools, tennis and volleyball courts, a nature trail, playgrounds, and a soccer field. If you are interested in viewing this home please contact Scott Boehnlein of Family Realty. We would love to show you around this beautiful home. One of the first things I ever ate in Lousville was an ice pop. Not just any ice pop, but a Steel City Pop! Even though it was the beginning of winter at the time I demolished that ice pop. How much more now that Summer is in full swing. 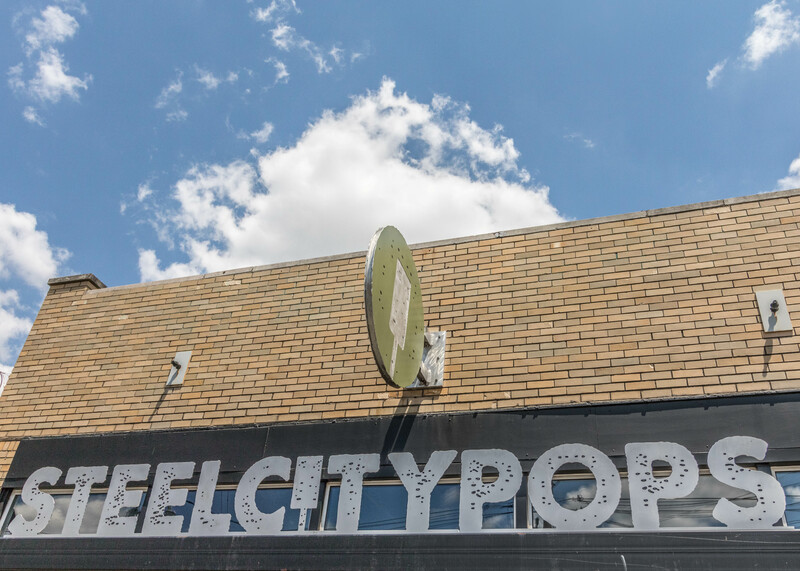 Steel City Pops was started by Jim Watkins with much help from his family and friends. 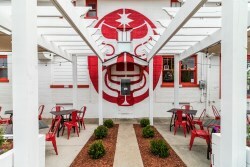 Steel City Pops was birthed out of Jim's lifelong dream to own a restaurant. At age 40 he quit his job and began researching as much as he could about restaurant ownership while also developing recipes with his mom. He acknowledges the immense support and help of his wife and four sons in the development and running of their first ever restaurant. 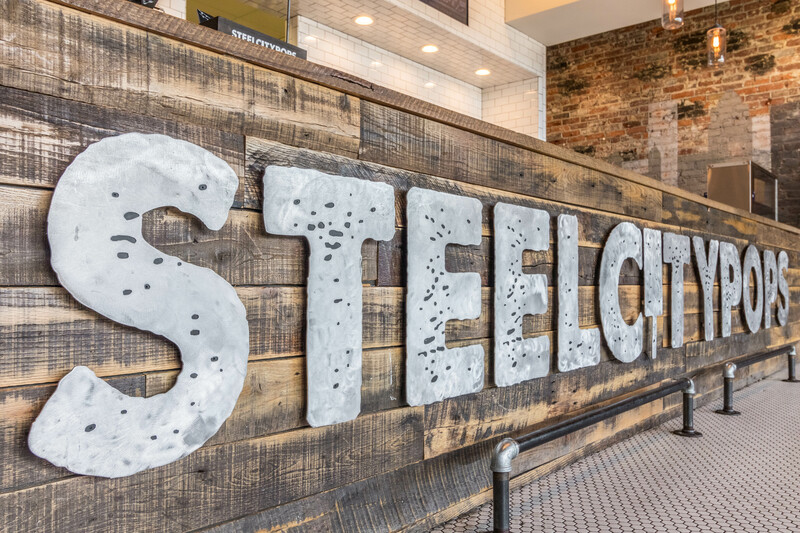 Steel City Pops now has 8 locations around the country. They serve scrumptious ice pops made with only all natural or certified organic ingredients, never using artificial flavors, colors, or preservatives. Some of their fruity flavors include blood orange, cucmber lime, lavender lemonade, passion fruit, and lime. If you would prefer a creamier option they also have flavors that include but are not limited to Avocado, Buttermilk, Chocolate, Chocolate Chili, and Coconut. As well as giving us great tasting pops they also give back to communities around the world. They give back globally to help provide water to places that don't have clean drinking water. They also give back locally to help those with disabilities and special needs. 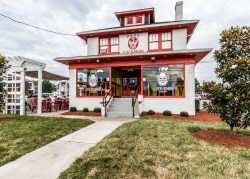 Steel City Pops in Louisville is located on Bardstown Rd in the Highlands. The Highlands started as a suburb, but is now one of the most desirable areas to live in Louisville. A prominent feature of the Highlands is its grand Victorian homes and craftsman bungalows. Cherokee Park with its many trails, playgrounds, and picnic spots is also located in the Highlands. 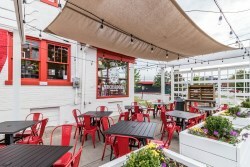 But probably the most well known feature of the Highlands is its many eclectic and authentic restaurants, especially along Bardstown Rd. If you are intersted in moving to the Highlands we would love to help you find a new home. Or if you are wanting to sell your home in the Highlands or anywhere in Louisville we would love to help you. Real estate Louisville is what we know. Please contact Family Realty and speak with Scott Boehnlein or any of our agents.